The final 3D text effect. To begin, let's create a brand new Photoshop document. Go up to the File menu at the top of the screen and choose New, or for a quicker way, press the keyboard shortcut Ctrl+N (Win) / Command+N (Mac). Whichever way you choose, Photoshop pops up the New Document dialog box. Enter the size you need for your document. For this tutorial, I'm going to enter a Width of 6 inches, a Height of 4 inches, and a Resolution of 300 pixels/inch, which is a standard resolution for professional quality printing. I'm also going to set my Background Contents to White, which will set the background color of my new document to white. When you're done, click OK in the top right corner of the dialog box to exit out of it. Your new Photoshop document will appear on the screen. Create a new Photoshop document using the New Document dialog box. Choose a font from the Options Bar. 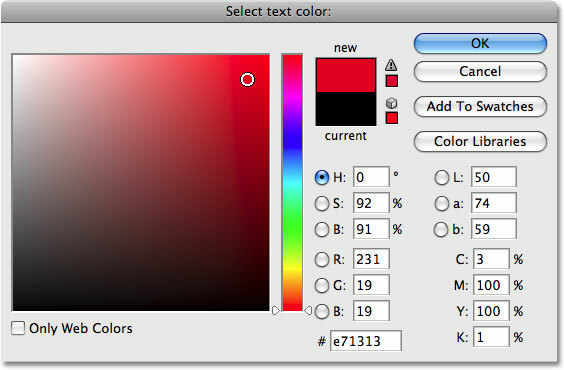 Change the color of the text by clicking on the color swatch in the Options Bar. Choose a new color for the text from the Color Picker, then click OK to exit out of it. The color swatch in the Options Bar will change to show the color you've selected. Click inside the document and add your text. Exit out of text editing mode by clicking on the checkmark in the Options Bar. The text appears on its own layer in the Layers palette. Select "Free Transform" from the Edit menu. Resize and move the text as needed with Free Transform. When you're done, press Enter (Win) / Return (Mac) to accept the change and exit out of the Free Transform command. To create our 3D effect, we need to alter the perspective of our text. There's only one problem though. Photoshop doesn't allow us to alter the perspective of text (see how that can be a problem?). To show you what I mean, make sure you still have the text layer selected, then go up to the Edit menu at the top of the screen and select Transform from the list. A secondary menu will appear showing all the various ways we can transform the contents of the layer we currently have selected. Notice how the Distort and Perspective options are grayed out? That means they're currently unavailable to us, and that's because Photoshop can't perform either of these two types of transformations on text. The solution is to convert our text layer into what's called a shape layer. By converting the text to a shape, we'll be able to change the perspective of it and create our effect. The only downside to converting text to a shape is that the type will no longer be editable. In this case though, since we have no need to edit our text, we don't need to worry about it. Go to Layer > Type > Convert to Shape. The text layer has been converted to a shape layer. Go to Edit > Transform Path > Perspective. Click on the bottom right corner handle and drag downward. The text now appears with a 3D perspective. With the Move Tool selected and the shape layer selected in the Layers palette, hold down your Alt (Win) / Option (Mac) key and press the right arrow key on your keyboard. Then press it again. Then again. And again. Notice what's happening? Each time you press the right arrow key with the Alt / Option key held down, you're creating a new copy of the shape layer and you're moving the new copy one pixel over to the right. Holding down Alt / Option tells Photoshop to create a new copy of the shape each time rather than simply moving the existing shape. The more times you press the right arrow key, the more copies of the layer you'll create, and the more depth we give to our letters. Hold down Alt (Win) / Option (Mac), then press the Right arrow key multiple times to give the letters depth. Each time we created a new copy of our shape, we created a new shape layer in the Layers palette, and Photoshop placed each new layer directly above the previous layer. In my case, my Layers palette now contains 68 copies of my original shape layer. The original shape layer is sitting above the Background layer, with all the copies piled on top of it. You can tell it's the original because it's the only shape layer that doesn't contain the word "copy" in its name. The original shape layer now appears above the other layers in the Layers palette. With our original layer now at the very top of the layer stack, we need to merge all of those copies of the shape layer down to one layer. Click on the layer directly below the original layer in the Layers palette (in other words, the second layer from the top). Then use the scroll bar on the right of the Layers palette to scroll down to the layer directly above the Background layer. Don't just click on it though to select it because that will deselect the layer you just selected at the top. Instead, hold down the Shift key on the keyboard and then click on the layer to select it. This will select both layers at the same time, along with every layer in between them. All of these layers will appear highlighted in blue in the Layers palette. All of the shape layer copies have been merged into a single layer. Select a Gradient Overlay layer style from the bottom of the Layers palette. Click on the gradient preview area in the Layer Style dialog box to choose a new gradient. Choose the Black, White gradient. Make sure the Style option is set to Linear and that the Angle is set to 90°. And there we have it! Check out our Text Effects or Photo Effects sections for more Photoshop effects tutorials!